At Headquarters RV Park near Crane Lake, MN, we’re dedicated to creating a vibrant summer community for you and your family. Whether you can stay a day, a week, a month, or the entire season, we hope you’ll settle in with us! Our beautiful, centrally located space near Voyageur National Park and new facilities provide everything you need to make this summer season the best of your life. Find your home away from home! Call or email today to reserve your 2018 space! Don’t miss out on the best summer of your life! Our lots book up quickly, so reserve your spot now! Check-in time is 12:00 P.M. Prior to checking in, all campers’ black water tanks must be empty. Campers must not use chemicals or deodorizers while using Headquarters hook-ups. Check-out by 10:00 A.M. If you would like this same site again next year, please be sure to reserve it at check out! Please review our reservation policies before booking your stay with us! We require a $50, non-refundable deposit at the time of booking to hold your spot. Your card will be billed for the FULL rate of the entire reservation for any cancellations, changes, or early departures made 30 days or less prior to your arrival. Whether you’re looking to reserve a spot for the entire season or for a shorter period of time, Headquarters has a place for you! Tucked into the Voyageurs area wilderness with plenty of events and attractions nearby, Headquarters is the perfect place to make summer memories. 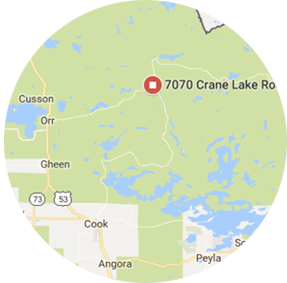 You can find Headquarters RV Park in heart of the breathtaking Voyageur area wilderness, on the border of Crane Lake and Buyck, Minnesota. Discover your home away from home. Beautiful campground with many outdoor recreational opportunities nearby. Great owners who offer a courteous and comfortable camping experience. BeautifulBeautiful campground with many outdoor recreational opportunities nearby. Great owners who offer a courteous and comfortable camping experience. campground with many outdoor recreational opportunities nearby. Great owners who offer a courteous and comfortable camping experience. Great camping experience!! Very clean and beautiful place! Will definitely be back! We had a perfect long weekend! Thank you Brad and Koreen! The RV park is beautiful! Can't wait to come back! © 2019 Headquarters RV Park.